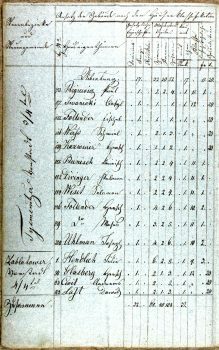 The next land and real estate survey—ordered by the imperial edict of Francis I in 1817 (and referred to as the Franciscan cadastre or Franciszkańska metryka) — records Jewish names using given names and hereditary surnames. Each record allows us to “reconstruct” places where Jews, Poles, and Ukrainians lived alongside each other. By matching house numbers with names — and with the help of a right cadastral map from the Gesher Galicia Map Room — the information may sometimes help you to trace who lived where in “your” town. This includes our direct ancestors, their extended families, and neighbors. Occasionally, a careful inspection of two records yields even more unexpected findings — real gems for the genealogist. Those are the tax lists of the town’s dwellers, with unique house numbers, prepared between 1780s and 1820s. One such example is from the Bohorodczany surveys. 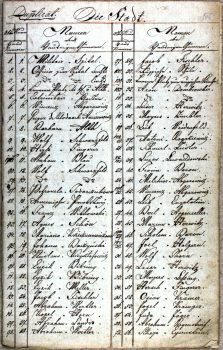 The tabulated list from circa 1789, assembled shortly after the adoption of surnames by the Jews, was found inserted somewhere between the pages. In a few instances, an invisible wall can now be breached, allowing us to connect the newly acquired family names with the patronymics recorded just two years before. Thus, Michel, the son of Mendel, became Michel Horner; Josio, the son of Dawid, became Josio Szmerler, and so on. The Josephine Survey: click here. To support the J&F Project: click here. For more details refer to articles: “Early Galician Population Surveys,” Galitzianer, March 2016 and “Research Project Updates,” Galitzianer, September 2017. 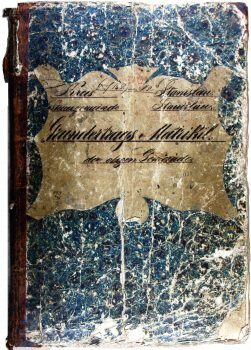 The cover and representative pages from the Franciscan survey 1819-1845. The land survey and tax rolls showed Jews earning their living from new land ownership and the variety of agricultural activities.